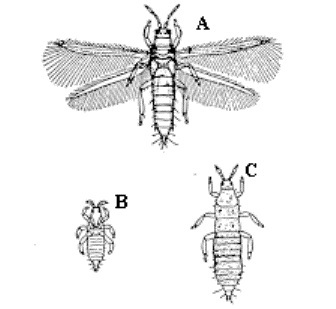 Region: This insect pest is found through out the vegetable-producing areas of the U.S. and Canada as well as in many other regions of the world. Life cycle: The female Thrip lays eggs (10 to 100) which she inserts singly into tender plant tissue that hatch 4 to 10 days later. 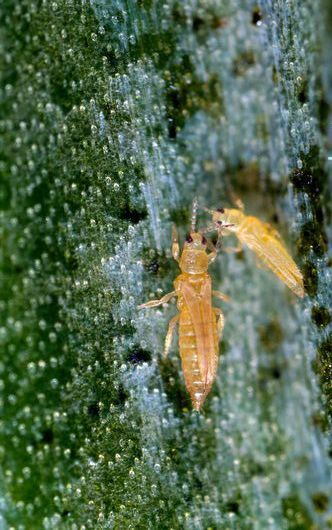 These thrips produce numerous generations each year. A new generation emerges every two to three weeks. When the eggs hatch, they undergo two larvae stages that actively feed on plant tissue. The larvae feed for about 5 days before pupating in the soil. About 4 days later, new adults emerge from the soil to feed and lay eggs. Although winged adults are frail fliers, they are capable of flying from plant to plant and can be carried long distances by wind. In some areas, overwintering occurs in the egg stage in plant debris. This insect pest breed year round in warm areas. Physical Description: Pale yellow to dark brown in color, the onion thrips adult is slightly less than 0.08 inches (2 mm) management) long. The two pairs of narrow wings are fringed with long hairs. Larvae are bean-shaped and white and about 0.01 inches (.25 mm) long. Feeding characteristics: This insect pest attacks onions, garlic, and related plants. Is also attacks cabbage, cauliflower, parsley, cucumber, melons, pumpkin, squash, kale, turnip, tomato, lettuce, bean, beet, pea, celery, blackberry, strawberry, and practically all other vegetable and truck crops. Thrips scrape the tender parts of center leaves and/or terminal buds with their razor-sharp mouth-parts and feed on plant juices. Leaves develop silvery blotches or scratch-like markings. Leaves may become distorted and curl upward. Light infestations tend to hinders plant growth and impedes maturity. Heavy infestations may kill terminal buds or even entire plants. On onions, leaves become curled, crinkled, and twisted, the growth stops, and plants die. When terminal buds on other types of crops are damaged, abnormal branching patterns result. Injury to the plant is more severe under hot-dry conditions. The Parasitic Wasps, Predatory Thrips, Predatory Mites, Lacewings, and Pirate Bugs are a natural predators and can help to control populations. For serious infestations, dust with Diatomaceous earth.